Welcome to our senior meditations page! Here, you can find a series of weekly meditations meant to guide you in your discernment of serving as a Missionary with Saint Paul's Outreach. Each week, a new meditation will be posted with reflective and challenging questions along with a short prayer. Ultimately, God desires each one of us to dwell in Heaven with Him. We are called to live our lives so as to come one day into the very presence of God Himself and dwell with Him forever. On that day there will be no mourning or weeping - everlasting Joy will be ours! Wherever we go in our lives. Whatever we choose to do. As we discern God’s will for us, we should be confident in His greatest desire for us: that we know his love and experience His provision and care for us. God has made us for relationships. God does not call us to be “Lone Rangers” handling all of life’s challenges on our own. We need others so that we might be strengthened in our own life and also bring strength and grace to others. Being with others gives us companionship and enthusiasm for life and work because the Lord did not create us to be alone. We need one another. Reflection: As you discern your future, consider how/where you will get support for your faith and your life. As I look at options for the next step in my life am I considering what avenues there are to support my Faith (local young adult groups, strong parishes, good work environments…)? How can I maintain contact and accountability with those who have been a strength to me over my college years? If God is calling us and we are following His will for our lives - He will provide for us in all things. God is trustworthy. “Let no one disregard you because of your youth but be a continuing example of love, faith, and purity…” (1 Tim.4:12). As you look ahead to the next step in your life do not underestimate ALL that you have gained in these years at school. You have grown in relationships, community, formation in character, integrity, discipline, self-knowledge, sense of your true identity as a beloved son/daughter of God. These areas of growth prepare you even better as you go forth from school to make a difference wherever God calls you. 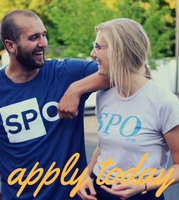 How have I benefited from my faith life and relationship with SPO during my time in college? How can these areas assist me as I look ahead to the next step in my life? Who I am - as a beloved Daughter/ Son of God? What I can do – Knowledge, Learning, Skills, trade, profession? Who I know – relationships, community, support? “The Harvest is abundant but the laborers are few; so ask the master of the harvest to send out laborers for his harvest.” (Mt.9:37). Look around you on your campus, at work, in your families. How many of your classmates, friends, relatives are unaware of the Love and Freedom that God has for them? How many are drifting away from their faith? Who will reach out to them? As Disciples of Christ, Jesus calls each of us to be His laborers in whatever field (vocation, profession) He leads us into. Reflection: Wherever God calls me, I am His disciple and He desires to use me there to bring others to know His life-saving love and mercy. As I look ahead at my options, am I aware of and looking for ways my choices will position me to live out my faith more fully? What are ways in which my Call to Holiness can be expressed/strengthened in the various options before me (as a teacher, businessman/woman, engineer, nurse, missionary, pilot, etc.)? How can I connect with some fervent Christians who work in the areas I am considering? Is there a way that I can talk to them about how they live out their faith in their daily lives? As you consider what God wants for your life - do not start by thinking through all of the options before you, but, begin with considering all that God has done for you. Think about How much God loves you. He has a plan for your life. He has made you for Greatness and calls you to a life of Freedom and Excellence. Make a “Gratitude” list of all that you have to be grateful for? We all desire to be free; but, what do we mean by “freedom”? In God alone do we find true freedom. As we submit our lives more fully to God and are formed in His ways our life expands and opens up to the freedom that God has for us. This freedom can be called Freedom for Excellence. What is my definition of freedom? How do I pursue it? Do the choices I make lead to greater freedom and growth in my relationship with God? Prayer: Lord, I give my life to You so as to live in the freedom that You desire for me. Within each one of us is a desire for more. If we really think about it, the problem is not that we expect too much but rather, that we ask too little from our Heavenly Father. One of the greatest things you can give God is your expectation. What is your level of expectation in your relationship with God? Prayer: Lord, I want all that you have for me. Show me who I was created to be. We spend a lot of time planning for our future, setting things in place for the ‘good life’. In the midst of this have we honestly taken time to ask ourselves and God what His plans and desires for us are? Do we seek the ‘good life’ or the ‘God life’? Which is more exciting and fulfilling? What are my plans for my life? Have I honestly brought them before God and sought His will, His plan for my life? Take some time this week to pray: “Here is my life Lord, where do You want me to go? Holy Spirit, guide me."